That's a saving of ~5%, which is much less than the ~50% savings that we get with the image in my original question. I've updated the title to reflect this update, but the original question is included below. In Photoshop's "Save for Web", why are animated gifs twize as large with transparency disabled? When I'm ready to save, I use "Save for Web" and look for ways to optimise it. These are the settings that are loaded automatically. The estimated file size is 1.871M. I uncheck "Transparency" since there is none in the image, thinking that this might reduce the size. But instead, the size is effectively doubled. The new estimated file size is 3.739M. So what I'd like to know is... why? Also, I'm using CS6 if that matters. Got some free time and decided to skim through the GIF Specification. For a layman (i.e. me) it's pretty dense. That said, I think I've found what makes the optimization possible. The Graphics Interchange Format is defined in terms of blocks and sub-blocks which contain relevant parameters and data used in the reproduction of a graphic. The Transparency Index is such that when encountered, the corresponding pixel of the display device is not modified and processing goes on to the next pixel. The index is present if and only if the Transparency Flag is set to 1. Interesting! So in the GIF format, tranparency means "don't draw anything in this space". 4-7 - To be defined. As you can see, only the pixels that have changed since the last frame are updated, and the rest have been left unaltered (transparent). That's a lot less information to store. When transparency is disabled, every frame has to be drawn in its entirety. So that's why enabling transparency in an animated gif saves space. If you're reading this, you might also want to check out this article, which goes over how the gif disposal method works in plain English. 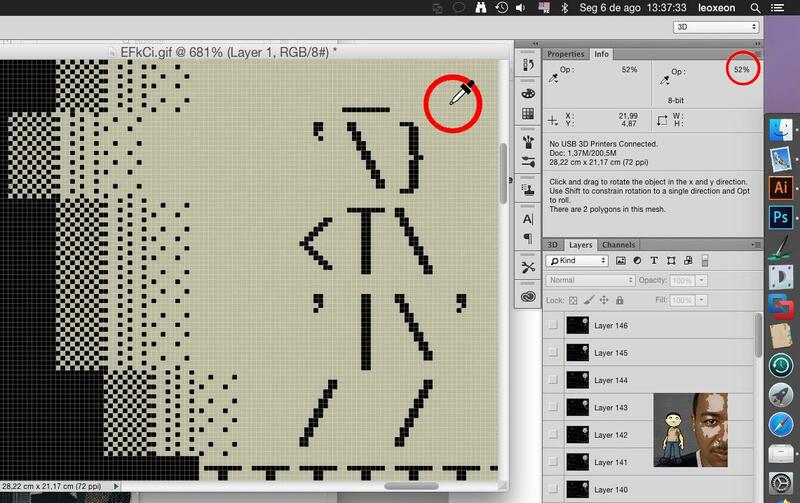 It does it in the context of a gif editing program called GIFBuilder but it's still good info! Finally, if anyone else has more insight into this please jump in. That's about the file you provided. Almost the colors have some transparency, but black color. Use the color picker in opacity mode to verify it by yourself. You can verify it in the color pallete while you're saving fo web. The last color is a transparency. Not the answer you're looking for? Browse other questions tagged adobe-photoshop gif compression optimization or ask your own question. 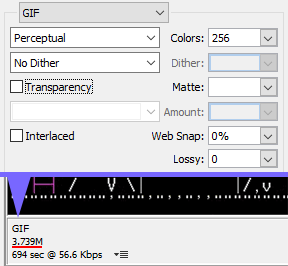 How to reduce file size of animated GIF?